Brussels sprouts, O’ how I love thee. Quite possibly my favorite veggie. Full of sulfur and amazing for detox, these sprouts have kept me detoxing since the day I was sick a few years ago. I swear I pop about 20 in my mouth a week. No additives. No preservatives. 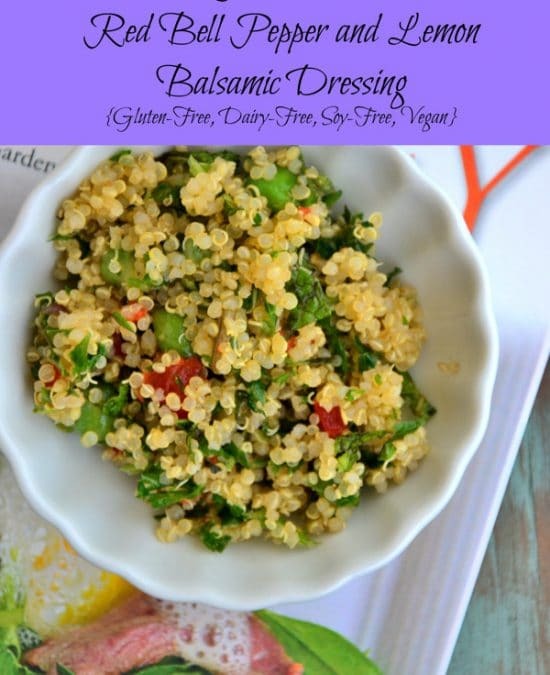 No yucky dressings or processed veggie oils-yuck. Just a little natural sweetness, a bit of healthy olive oil and a whole lotta veggie goodness loaded with fiber and a few spoonfuls of protein-packed quinoa topped off with my creamy raw cashews that add the perfect crunch and dose of healthy fat to keep you satisfied and not craving those gross holiday donuts in your office kitchen- or those processed Hershey’s kisses in your cubicle. Steer clear of those this season, folks and treat yourself to a nice bite or two of pure dark chocolate instead! You’ll thank me later when you don’t get an energy crash. This Brussels sprouts recipe is filled with natural sweetness and you’re gunna love every bite. It’s a main dish that’s got the sweetness of dessert written all over it- without the refined sugar — so you won’t be raiding the cabinets for sweets later this evening. I can assure you of that! Dig in. Report back! Tell me what you think. Add a drizzle of honey or maple syrup and you’ll be in heaven. 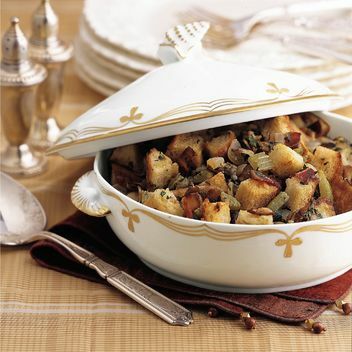 Give yourself a little holiday lovin’ and dig into this bowl of hearty goodness. And…if you’re free tonight from 6PM EST-6:30PM EST join me on twitter where I’ll be hosting the Larabar Twitter Chat for 30 minutes with lots of giveaways to attendees. 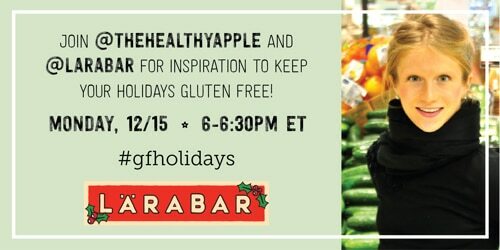 You can follow #gfholidays during the party to follow along and get involved. Hope to see you there! 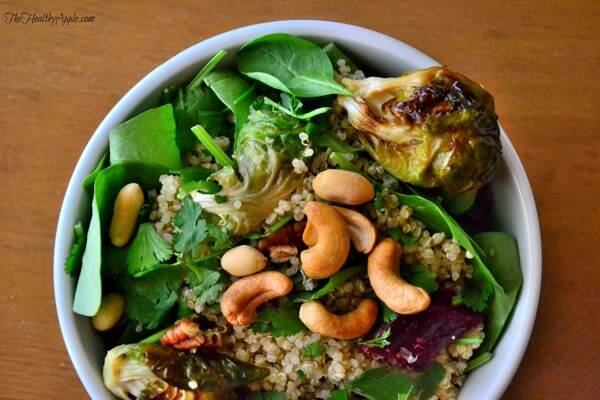 Meanwhile, toss Brussels sprouts with 2 Tbsp. olive oil, sea salt and pepper. Place on a rimmed baking sheet and roast for 35-40 minutes or until tender and golden brown; shake the pan every 10 minutes to ensure even cooking. Remove from oven; set aside. 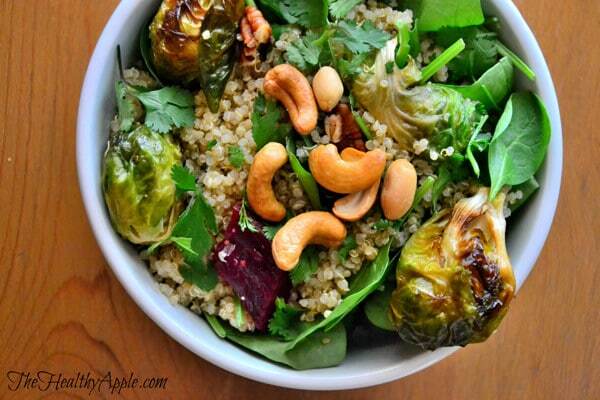 In a large bowl, combine cooked quinoa, Brussels sprouts, spinach, cilantro and cashews. In a small bowl, whisk vinegar, remaining 1 Tbsp. olive oil, maple syrup or honey, sea salt and pepper; pour over quinoa mixture and toss to combine. I don’t understand this recipe. 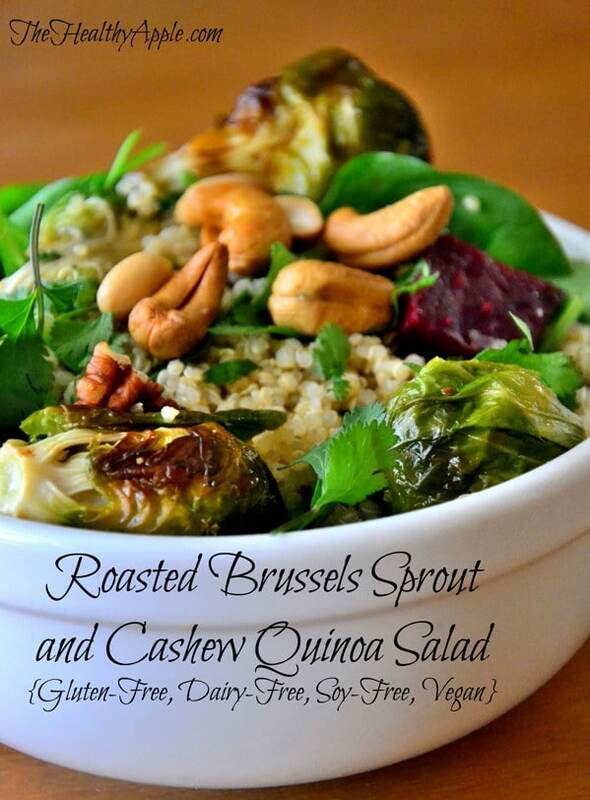 It’s titled “Roasted” but you steamed the brussels sprouts?? I agree. Even in the picture the brussel sprouts don’t look steamed at all. How did you roast them? The recipe was updated from steamed to roasted on Monday- you can refresh your page to make sure the change went through on your end! Thanks!! Thanks Isabell, I made this recipe steamed and roasted but the roasted came out much better so that’s why I updated the recipe for roasted. The recipe has been updated since the day it posted so try refreshing your page. Thanks and enjoy!! I made this for a luncheon today. It was delicious! I roasted the Brussels sprouts and also roasted butternut squash. Added hearts of Palm and pomegranate seeds! Everyone loved it! Oh and I served it w arugula, kale and spinach!! You can do either-I tried it both ways but for this I used roasted! So healthy. Will definitely try this recipe. 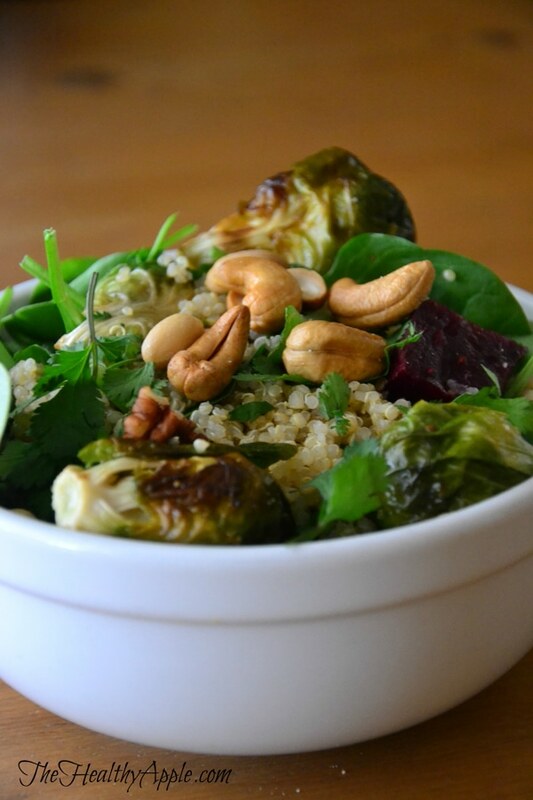 I am a huge huge fan of brussel sprouts – and I have only been eating them a year! Our local farmers market lady and I were talking about them, since they had a huge bin full (bumper crop), and she gave me some to try with clear instructions on how to cook them. I have been hooked ever since. My go to has always been roasted with a little olive oil and salt, and then tossed with a white balsamic vinegar and lemon oil. I can’t wait to try this recipe! I have all the ingredients. A must try dish. This looks amazingly delicious. I may add dried cranberries to them. I will definitely be trying this one! 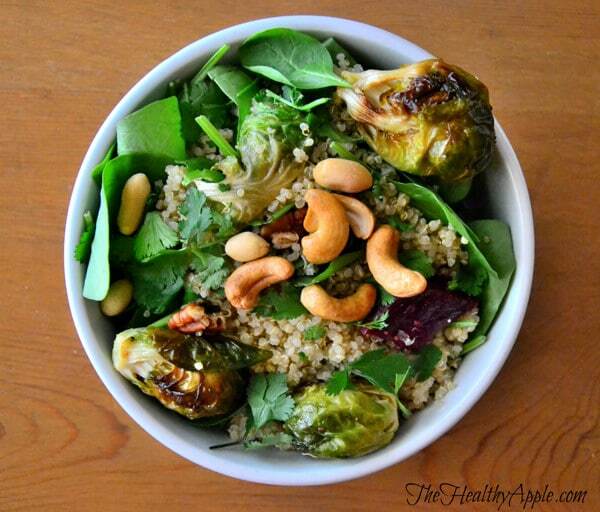 love brussel sprouts…a must try! I can’t wait to try this recipe! It looks fantastic. Can’t wait to try this. Been loving your similar detox salad. Random question: in the photo, there is something bright red/purple touching the cashews that almost looks like a cube of beet. What is that? OK, now I’ve made it (although minus cilantro) and it’s perfect. But beets would be even better! Thanks for the tip.